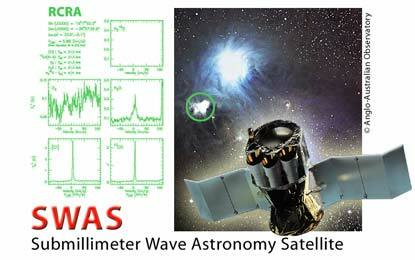 SWAS, the Submillimeter Wave Astronomy Satellite, was launched on December 5, 1998 and made observations until July 21, 2004. SWAS measured the amount of water and molecular oxygen in interstellar clouds, and also the amounts of carbon monoxide and atomic carbon, which are believed to be major reservoirs of carbon in these clouds. SWAS was one of NASA's Small Explorer Program (SMEX) missions. The overall goal of the mission has been to gain a greater understanding of star formation by determining the composition of interstellar clouds and establishing the means by which these clouds cool as they collapse to form stars and planets. The spacecraft has made detailed 1 degree x 1 degree maps of many giant molecular and dark cloud cores during the first five years of the mission. In June 2005, the spacecraft was reactivated for a 3 month period (after a year of stand-by operation) in order to observe the effects of the Deep Impact probe's collision with Comet P/Tempel 1. SWAS has made new data public every six months. The final release was made in mid-2005.